2 Centro de Investigación en Biodiversidad y Conservación, Universidad Autónoma del Estado de Morelos, Av. Universidad 1001, 62209 Cuernavaca, Morelos, México. 3 Departamento de Ecología de la Biodiversidad, Instituto de Ecología, Universidad Nacional Autónoma de México, Apartado postal 70275, 04510 México, D.F., México. 4 Departamento de Zoología, Instituto de Biología, Universidad Nacional Autónoma de México, Apartado postal 70153, 04510 México, D.F., México. Although phylogenetic affinities of Mexican jackrabbits within the genus Lepus have been evaluated for a few species, no study has included all 5 species occurring in Mexico. In this study we assess the phylogenetic position of the Mexican species relative to other forms within the genus and evaluate evolutionary affinities among the Mexican forms. To do so, we analyzed 57 complete cytochrome b sequences belonging to the 5 Mexican jackrabbits and 18 species of Lepus distributed across Asia, Africa, Europe and America. We performed phylogenetic tree reconstruction with the neighborjoining, maximum parsimony and maximum likelihood approaches. We also used a minimum spanning network to evaluate relationships among Mexican species. We found 5 main phylogenetic groups within Lepus, 4 of which corresponded to geographically well defined lineages. One group included L. americanus, 3 others corresponded to Mexican, African and European species, respectively. A fifth group included Asiatic, European and American forms. Our results suggest that Mexican species constitute a monophyletic entity that evolved independently of the other American species of Lepus. Within the Mexican forms, 2 main clades are apparent; 1 that includes L. alleni, L. callotis, and L. flavigularis, previously referred to as the whitesided jackrabbits, and a second one that groups together L. californicus and L. insularis, although L. californicus is a paraphyletic relative of L. insularis. Key words: cytochrome b, Mexico, mitochondrial DNA, phylogeny. Aunque la afinidad filogenética de las liebres mexicanas, dentro del género Lepus, ha sido evaluada para algunas especies, ningún estudio ha incluido las 5 especies que se presentan en México. En este trabajo estimamos la posición filogenética de las especies mexicanas de liebres en relación con otras formas dentro del género, y evaluamos las afinidades evolutivas entre ellas. Para ello analizamos 57 secuencias completas del citocromo b pertenecientes a las 5 especies mexicanas y 18 especies de Lepus distribuidas en Asia, África, Europa y América. La reconstrucción filogenética se realizó mediante los procedimientos de neighborjoining, máxima parsimonia y máxima verosimilitud. También se empleó el enfoque de redes de haplotipos para evaluar las relaciones entre las especies mexicanas. Observamos 5 grupos filogenéticos principales dentro de Lepus, de los cuales 4 corresponden a grupos geográficamente bien definidos: 1 grupo está constituido por L. americanus, otros 3 están formados por especies mexicanas, africanas y europeas, respectivamente. Un quinto grupo incluyó de manera conjunta a especies asiáticas, europeas y americanas. Nuestros resultados sugieren que las especies de liebres mexicanas forman un grupo monofilético que evolucionó independientemente de otras formas americanas. Dentro de las formas mexicanas existen aparentemente 2 clados principales; 1 que incluye L. alleni, L. callotis y L. flavigularis, previamente reconocidas como liebres de costados blancos, y un segundo que agrupa a L. californicus y L. insularis, aunque L. californicus tiene una relación parafilética con L. insularis. Palabras clave: citocromo b, México, ADN mitocondrial, filogenia. The family Leporidae (hares, jackrabbits and rabbits), which includes 11 extant genera and approximately 56 species, is a successful group with a worldwide distribution, originally absent only from Australia and southern South America, West Indies, Madagascar and some Ethiopian islands, in many of which they have recently been introduced (Robinson, 1980; Chapman and Flux, 1990). Because of the intricate relationship of many leporid species with different ecosystems, as well as the commercial importance of game species, they have been the focus of ecological, genetic, and taxonomic studies (Corbet, 1978, 1983; Chapman and Flux, 1990; Halanych and Robinson, 1997, 1999). However, little is known about the evolutionary history of the family (Halanych et al., 1999; Wu et al., 2005). The genus Lepus is the most diverse group within the family Leporidae, with 32 formerly recognized species, only followed by Sylvilagus and Pronolagus with 17 and 3 species, respectively (Hoffman and Smith, 2005). Despite being speciesrich, this group shows little morphological variation, which has in turn made it difficult to define the taxonomic status of some of its species, as well as reconstructing their genealogical relationships. Direct access to the genetic material of organisms (DNA) and development of modern methods of analysis have given new insights into the evolution of the genus Lepus. Halanych et al. (1999) performed the first more comprehensive study of the phylogenetic relationships of Lepus, including 11 species and using partial sequences of cytochrome b. They report different tree topologies generated by distinct reconstruction methods, concluding that Lepus species from North America are not a monophyletic group and that the taxonomic status of some lineages should be reevaluated. In a later phylogenetic study that included 11 species of Lepus, also using partial cytochrome b sequences, Yamada et al. (2002) confirmed that North American Lepus are not monophyletic, since some American forms are grouped within the clade comprising African, European and Japanese species. In the most recent work concerning the evolution of the genus Lepus, Wu et al. (2005) analyzed partial cytochrome b sequences of 23 species and demonstrated that although some clades display certain geographic cohesion, patterns of current distribution within each of the main continental regions, may not be explained by local monophyletic origins. Although previous studies on the phylogeny of Lepus have included representative species from North America, none of these have included all forms that are found in Mexico. This country is one of the most diverse in terms of number of species, since 5 Lepus species, which together are commonly known as jackrabbits (Flux and Angermann, 1990; Hoffman and Smith, 2005), occur here. One species, L. californicus, displays a wide distribution from southwestern United States (USA) to central Mexico. Two other species have most of their distribution in Mexico, although they may also be found in restricted areas in USA near the border with Mexico: L. alleni occurs on the entire north coast of the Mexican Pacific to southern Arizona (USA), and L. callotis is distributed from Oaxaca in southern Mexico to Chihuahua in northern Mexico, with a population in southern New Mexico (USA). On the other hand, L. flavigularis and L. insularis are endemic species of Mexico; the former occurring in a small tropical region of the Isthmus of Tehuantepec in the state of Oaxaca, and the latter in the Espiritu Santo Island, Baja California Sur. These 5 species, with all or most of their geographical range in Mexico, represent the southernmost distribution of the genus in the American continent. The objectives of the present study were: 1) to assess the phylogenetic position of the Mexican species within the genus Lepus, in order to discern if all Mexican forms share a common origin or if they are the result of independent evolutionary events, and 2) to evaluate the evolutionary affinities among the Mexican species, in order to test previous hypotheses that suggest a close relationship among certain forms (Anderson and Gaunt, 1962; Dixon et al., 1983; GonzálezCózatl, 2000). To accomplish this, we analyzed nucleotide sequence data of the complete cytochrome b gene of all 5 Mexican forms of Lepus and compared them with those of other representative species from Asia, Africa, Europe and America, encompassing the complete geographical range distribution of the genus. We also analyzed a group of partial sequences of this same gene representing different localities of the Mexican forms. A matrix of complete cytochrome b (cyt b) nucleotide sequences (1 140 bp) of 57 individuals representing 23 species of Lepus was built (see Table 1). 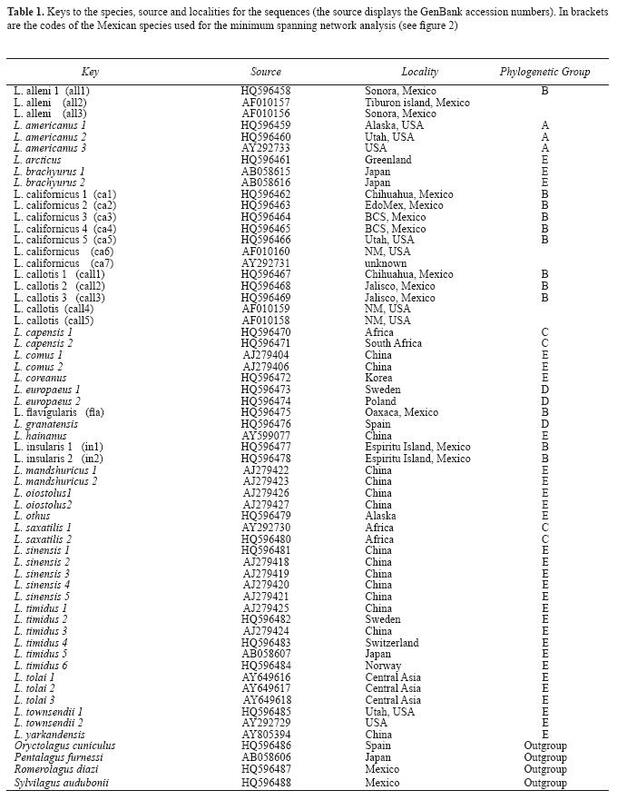 Twentythree Lepus sequences were obtained from the DDBJ/EMBL/GenBank International Nucleotide Sequence Databases and the remaining 28 (remaining 28 (Accession numbers HQ596458HQ596485) were from GonzálezCózatl (2000) (Table 1). In addition, 4 sequences were used as outgroups from Oryctolagus, Sylvilagus, Romerolagus (GonzálezCózatl, 2000) and Pentalagus (GenBank). Alignment of sequences was performed with the multiple alignment program Clustal W (Thompson et al., 1994) and corrected by hand for obvious alignment errors. Assessment of sequence composition was done in order to evaluate frequencies for variable and parsimonious informative sites in the first, second and third codon positions, with the DNAsp program (Rozas and Rozas, 1999). This analysis was done with and without outgroups. Phylogenies were estimated using maximum parsimony (MP) and the minimum evolution (as implemented in the Neighbor Joining algorithm; NJ) optimality criteria using PAUP* (version 4.0 beta; Swofford, 2002). Additionally, the maximum likelihood (ML) approach was performed using the program PHYML (Guindon and Gascuel, 2003). The bestfit model of evolution for the NJ and ML procedures was identified based on the hierarchical likelihoodratio test under the Akaike Information Criterion implemented in Modeltest 3.06 (Posada and Crandall, 1998). Based on previous Lepus studies with cyt b (Halanych et al., 1999; Yamada et al., 2002) and in order to facilitate comparisons among studies, we also performed NJ and ML analysis using Kimura's (1980) twoparameter model (K2P), with a γ correction (α= 0.5). MP analyses were based on heuristic searches with 1000 random additions and implementing the tree bisectionreconnection (TBR) algorithm. NJ reconstruction was conducted employing genetic distances corrected under the optimal evolution model selected by ModelTest. ML analyses were performed following the algorithm of Guindon and Gascuel (2003), also using the bestfit model of evolution for the cyt b data. Confidence in resulting nodes was assessed using the bootstrap approach (Felsenstein, 1985) with 1000 replicates for NJ, MP and 500 for ML. Monophyly of Mexican Lepus was tested by conducting tree searches with constraints configured to match tree topologies where Mexican jackrabbits form a monophyletic group. Alternative tree topologies were evaluated for statistical significance using the Shimodaira and Hasegawa test (SH; Shimodaira and Hasegawa, 1999) under the maximum likelihood criterion as implemented in PAUP* (version 4.0; Swofford, 2002). Ten thousand bootstrap replicates were performed using the SH test by resampling the partial likelihoods for each site (RELL model). Net nucleotide divergence (Da) (Nei, 1987) was estimated between the resulting major clades in the phylogenetic tree (see Results) to assess patterns of genetic differentiation within Lepus. To do this we employed the DNAsp program using the Jukes and Cantor correction. Kimura twoparameter genetic distances were estimated with MEGA 3.0 software (Kumar et al., 2004) in order to do pairwise comparisons among and within main clades. Standard errors were estimated by the bootstrap method with 10 000 replicates. Additionally, phylogenetic affinities among Mexican species of Lepus were evaluated by doing a minimum spanning network, which illustrates the minimum number of mutational steps between haplotypes, constructed using TCS 1.20 at p ≥ 0.95 (Clement et al., 2000). Under this approach we analyzed cyt b partial nucleotide sequence (620 bp) from 18 individuals of species with distribution in Mexico, including redundant sequences (Accession numbers AY292731, AF010156160; Table 1). Also, a Mantel test was used to measure the correlation between the individuals pairwise geographical distances (km) with the individuals pairwise genetic distances, using ARLEQUIN 2.0 (Schneider et al., 2000). Phylogenetic analyses. Of the 1140 positions examined, 497 were variable (43.6%), and 393 (34.5%) were parsimony informative. The majority of the variable sites (90%), as well as most of the parsimony informative sites (79.7%) occurred at the third codon position. When outgroup taxa were excluded from the analysis, the same proportion of variable and informative sites were obtained in the complete gene. Also most of these variable and parsimony informative sites occurred at the third codon position. The parsimony searches generated 88 most parsimonious trees, with length (L = 1980), consistency index (CI = 0.354) and retention index (RI = 0.681; trees not shown, but see below). The General Time Reversible model (GTR; Rodríguez et al., 1990) of DNA substitution was selected as the most appropriate for our data (base frequencies A = 0.2899, C = 0.3309, G = 0.1160, T = 0.2676, proportion of invariant sites I = 0.4978, and shape parameter a = 1.0920). NJ and ML reconstruction methods recovered the same topology whether constructed with the K2P or the GTR models. Very similar trees were obtained with all methods, ML, NJ and MP, with only minor topological differences within groups. Accordingly, results are described based on the phylogenetic topology depicted with ML constructed with the GTR model (Fig. 1). 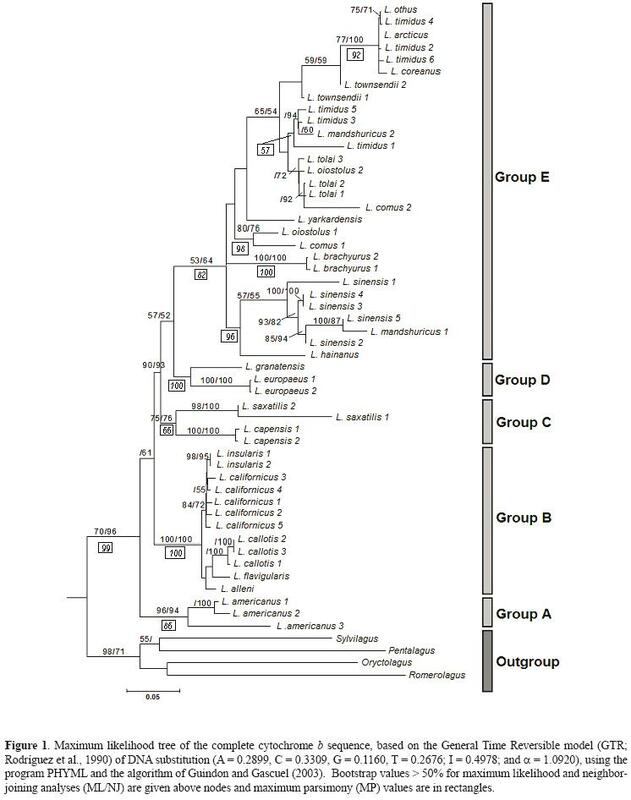 Overall, samples of Lepus were grouped into 5 main clades. Group A corresponded to representatives of L. americanus, and was placed as a basal group within the genus, with relatively high bootstrap values (NJ and MP). Another clade (Group B) was constituted exclusively for the "Mexican" species (L. californicus, L. insularis, L. alleni, L. flavigularis, and L. callotis), and strongly supported by MP, ML, and NJ bootstrap values. As sister groups of the "Mexican" clade, the groups C, D, and E appeared. Groups C and D were formed by 2 exclusively African species, L. capensis and L. saxatilis and 2 exclusively European ones, L. europaeus and L. granatensis, respectively. Finally, group E encompassed forms found in Asia (L. timidus, L. sinensis, L. comus, L. oiostolus, L. brachyurus, L. mandshuricus), Europe (L. timidus), and North America (L. arcticus, L. othus, and L. townsendii), although bootstrap support for this clade was relatively low (Fig. 1). Tree searches under constraints (no monophyly of Mexican Lepus) produced significantly less likely tree topologies than those where Mexican jackrabbits are a monophyletic clade (Log Score Difference = 564.34; pvalue < 0.0001). Within the "Mexican forms", L. californicus resulted in a paraphyletic group since samples L. californicus 1 and 2 were more closely related to representatives of L insularis than to other samples of L. californicus. Additionally, L. alleni, L. callotis, and L. flavigularis formed a separate clade, where the last 2 forms are more closely related to each other (Fig. 1). Genetic differentiation. Genetic distances estimated among groups varied from 10.8% between groups B and D, to the most distant values between group A and both C and E groups, 13.8 and 13.6%, respectively (Table 2). Values were also high between groups A and D, and between E and C (12.7 and 13.1 %, respectively). Estimates of genetic differentiation within groups were comparatively low for group B (2.5 %), whereas groups A and D displayed intermediate levels of differentiation (7.4 and 6.6 %, respectively); high values of genetic distances were shown for groups C and E (10.6 and 10.7 %, respectively; Table 2). On the other hand, high nucleotide divergence values were observed between group A and group B, C and D (5.66.0%); noticeably, the highest value occurred between groups B and D (6.4%) that had the lowest genetic distance. The lowest divergence value (4.3%) was between group E and both C and D (Table 3). The probability of parsimonious connections at p ≥ 0.95 in the minimum spanning network analysis was statistically justified for haplotypes that differed up to 11 mutational differences. Each analyzed sequence corresponded to a different haplotype, only L. callotis 4 and 5, and L. callotis 2 and 3 share the same haplotype respectively. 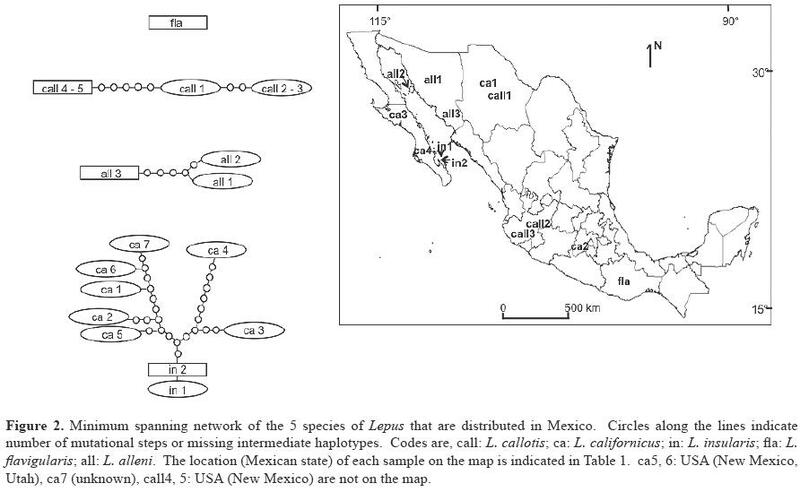 This analysis generated independent haplotype networks for each of the "Mexican" species, with the exception of samples of L. californicus and L. insularis, which were grouped together into a single network. (Fig. 2). This approach revealed high haplotype differentiation among species. Also, results of the Mantel test were significant (r = 0.207, P = 0.038). Phylogenetic analysis. This study represents a considerably comprehensive sampling of Lepus, in terms of number of species, geographical extent, and sequence size, though it unfortunately excludes a few species, mainly from Africa and Europe (L. castroviejoi, L. corsicanus, L. fagani, L. habessinicus, L. microtis, L. nigricollis, L. peguensis, L. starcki, and L. tibetanus), for which no complete cyt b sequences could be obtained. The sequence variation on the entire cyt b gen of Lepus displays the typical variability proportion found in other mammals, although the percentage of variable and informative sites showed a marked increase with respect to values previously reported for leporids (Halanych and Robinson, 1999) and Lepus (Halanych et al., 1999), based on partial cyt b sequences. In general, main phylogenetic clades corresponded well with the geographical distribution of species. Group A included samples of L. americanus, which occurs exclusively in North America. Group B grouped forms that are distributed in Mexico (L. alleni, L. insularis, L. flavigularis), and southern North America (L. californicus, L. callotis). Although group C included species with a broad distribution, such as L. capensis, samples recovered in this clade are restricted to Africa. Group D holds species occurring exclusively in Europe. The exception to the described pattern is found in group E, which comprises species from Asia, Europe, and North America (Fig. 1). The placement of North American taxa (L. arcticus, L. othus, and L. townsendii) within group E, which is clearly separated from other forms occurring in this region (groups A and B), suggests a nonmonophyletic origin of the Lepus in North America. This finding is congruent with previous hypotheses regarding the evolutionary relationships among North American forms based on molecular evidence (Halanych et al., 1999; Matthee et al., 2004; Wu et al., 2005). Although Halanych et al. (1999) suggested that, within North American hares, L. americanus is more closely related to the Mexican species of Lepus (their Western American clade) than to the Arctic hares, our findings do not support this opinion. Phylogenetic trees show that L. americanus (group A) and the Mexican species (group B) are not closely related. Rather, L. americanus was placed as the most basal lineage within the genus, suggesting that this group represents an early offshoot in the evolution of the genus; a scenario that is congruent with that of Matthee et al. (2004) and Wu et al. (2005). On the other hand, the Mexican species clade (group B) constitutes a second more basal lineage, which is placed as the sister clade to the remaining Lepus species (groups C, D, and E), suggesting that the Mexican lineage is closer related to the Arctic forms than to L. americanus. Admittedly, boostrap support for this relationship is not strong, but a similar evolutionary scenario has been reported by Matthee et al. (2004), who employed a supermatrix of nuclear and mitochondrial genes, and Wu et al. (2005), who used a partial cyt b data sequences data set (~ 700 bp). This consistent pattern suggests that the Mexican lineage (group B) originated independently of L. americanus and the Arctic forms, and if so, evolution of North American Lepus must have implied, at least, 3 major speciation events. Levels of genetic differentiation between Mexican jackrabbits and other clades ranged from 10.8 to 12.2% suggesting a significant degree of evolutionary divergence of this lineage with respect to other groups of hares. On the other hand, values of genetic distance within the Mexican jackrabbits were comparatively the lowest (2.5 %; Table 2) among all clades found, supporting a close evolutionary affinity among the Mexican species. Although the assessment of the evolution of the genus as a whole is beyond the objectives of this study, our results confirm previous hypotheses based on fossil and molecular data. Particularly, our analyses agree with earlier hypotheses that suggest an American origin of Lepus at about 10.7  11.8 million years ago (Mya) and a posterior radiation to other continents from North America approximately 5.1  5.6 (Hibbard, 1963; Matthee et al., 2004; Wu et al., 2005). According to molecular data, L. americanus is suggested to represent an independent and one of the oldest lineages within the genus (Matthee et al., 2004; Wu et al., 2005). This small species, adapted to life in or near boreal forests, was considered to be morphologically more similar to members of the genus Sylvilagus than to members of its own genus (White and Keller, 1984). Furthermore, it was suggested that L. americanus could be distantly related to other hares and jackrabbits and may warrant a separate generic designation (Flux, 1983). However, this present study and other studies have indicated that this species is correctly classified as a hare (Halanych et al., 1999; Yamada et al., 2002; Matthee et al., 2004; Wu et al., 2005), but it represents the sister group of the remaining species within the genus, which together represent forms that prefer open or semiopen country . Thus, it seems plausible that an initial spilt within the genus involved the adaptation to quite distinct ecological requirements for each of the resulting groups. In fact, Matthee et al. (2004) suggested that the initial trigger for the continental dispersal of the genus Lepus was the global development of grasslands at about 7 to 5 Mya. If so, it makes sense that most forms adapted to open or semiopen areas (including the Mexican species) are consistently grouped together (groups B, C, D, and E). Nonetheless, it seems that within grassland adapted forms, a lineage remained in North America (Mexican species; group B) while other lineages (groups C, D, and E) dispersed into other continents. However, considering that some members of group E are currently found in North America (L. arcticus, L. othus, and L. townsendii), their occurrence in this region might be explained by a secondary interchange between continents that resulted in the invasion of North America by some Asian forms through a land bridge, as suggested by Halanych et al. (1999). The Mexican species. Although prior studies had included samples of species that occur in Mexico, this research is the first that incorporates representatives of all forms occurring in this country (L. californicus, L. alleni, L. insularis, L. callotis, and L. flavigularis). As indicated above, our results suggested a common evolutionary history of these species since all of them were consistently recovered as a monophyletic clade with strong nodal support (Fig. 1; group B). This phylogenetic pattern is congruent with the view of Anderson and Gaunt (1962) who suggested a close affinity among L. alleni, L. callotis, L. flavigularis, and L. californicus, based on morphological and distributional criteria. Although L. insularis was not included in the study by Anderson and Gaunt (1962), later evaluations pointed out a close relationship between this species and L. californicus (see below). Within the Mexican clade, there are 2 apparent main lineages: 1 constituted of L. californicus and L. insularis, and a second one that included L. alleni, L. callotis, and L. flavigularis. Although nodal support is only relatively strong for the first group, and, therefore interpretations should be taken cautiously considering that we analyzed only a few samples for the Mexican species, but the recognition of this grouping pattern is congruent with previous hypothesis regarding relationships among these species (Anderson and Gaunt, 1962). The particular relationship between L. insularis and L. californicus was supported by bootstrap proportions over 72% (Fig. 1). Also, the haplotype network approach suggested a close relationship between these 2 species (Fig. 2). This coincides with the analysis by Dixon et al. (1983) suggesting a close affinity between these 2 species. Nonetheless, results also indicated that L. californicus is a paraphyletic relative to L. insularis. All our analyses demonstrated that some haplotypes of L. californicus (3 and 4) are more closely related to L. insularis than to other haplotypes of L. californicus (Fig. 1). Also, the TCS network showed that the pathway connecting L. californicus haplotypes 3 and 4 to L. insulairs haplotypes implies less mutational steps than those connections to other samples of L. californicus (Fig. 2). Although L. insularis is recognized as a distinct species from L. californicus based on an analysis of cranial features (Dixon et al., 1983), its specieslevel status has been questioned (Chapman et al., 1983; Flux, 1983). L. californicus has the most widespread distribution of the 5 species, while L. insularis occurs exclusively in Espíritu Santo, an island of volcanic origin in the Gulf of California that has been present for only 5 000  12 000 years (Faeth and Connor, 1979). It is thought that this species is derived from a population of L. californicus from the nearby peninsula of Baja California (Thomas and Best, 1994). Paraphyly is a phenomenon that has been reported in other hare species and has been explained through mechanisms such as retention of ancestral polymorphism (PérezSuárez et al., 1994) or ancient introgression (Thulin et al., 1997; 2006; Thulin and Tegelstr, 2002; Alves et al., 2003; 2008; MeloFerreira et al., 2007;). Nonetheless, it is clear that our results are based on a limited sampling and that the interpretation of the paraphyletic relationship of L. californicus to L. insularis should wait for additional data. If the results obtained in this study actually reflect the species phylogeny, L. insularis would represent an isolated population of L. californicus. Evidently, a more detailed sampling and information from alternative markers are required to evaluate the specific status of L. insularis relative to L. californicus. The second main lineage within Mexican jackrabbits includes L. alleni, L. callotis and L. flavigularis (Fig. 2), a group that is consistent with the view of Anderson and Gaunt (1962) who proposed a close relationship among these species based on morphological and distributional evidence. These 3 species have traditionally been grouped as the whitesided jackrabbits. Anderson and Gaunt (1962) suggest a common origin of these species from a population of L. californicus that could have become isolated in Mexico and diverged into a new lineage that was the original stock of the whitesided jackrabbits. From this main stock (L. callotis), one population was isolated on the western costal plains (L. alleni). Later, a second population was isolated in a small region in the Isthmus of Tehuantepec near the Pacific coast and became a different species (L. flavigularis). Although it is clear that our results are weakly supported regarding relationships among these species, and they are based on only a few individuals, the phylogenetic pattern obtained is congruent with the hypothesis of Anderson and Gaunt (1962). Under the haplotype network analysis, the probability of parsimonious connections at p ≥ 0.95 was not statistically justified to connect haplotypes of these species, suggesting that all 3 taxa represent independent lineages (Fig. 2). It is particularly important to mention that L. californicus, L. insularis, L. alleni, L. flavigularis, and L. callotis, are all listed as endangered, vulnerable or under special protection by the Mexican government and/or the IUCN (HiltonTaylor, 2000; Semarnat, 2002). Recently, Rico et al. (2008) showed that L. flavigularis possesses a reduced genetic variability and is subdivided into highly divergent lineages. These findings have tremendous implications for conservation and indicate the need of further research regarding the ecology and population genetics of the remaining Mexican species. A complete phylogeographic study will help elucidate how the intricate geological and biogeographical history of Mexico has shaped the present distribution of these species, and will ultimately provide information for a thorough evaluation of those species facing conservation problems. We thank A. VázquezLobo for her kind assistance with endless phylogenetic analyses questions. EVD acknowledges support from the Instituto de Ecología, UNAM. We are greateful to 2 anonymous reviewers for their comments that helped improve the manuscript. The first author was the recipient of a scholarship from Conacyt (No 153852).